Born in the Dominican Republic and with a background in Creative Design and Illustration, New York artist Samuel Gomez's meteoric rise began with his inclusion in the 2013 ArtPrize Competition in Grand Rapids, MI, his first showing in any public forum. His piece “Deadpan Comedy” attracted the attention of Colossal, Juxtapoz, Hi-Fructose and many other publications and blogs, virtually gaining him instant renown. He has since showed in Germany, The UK, France, Spain and Serbia and joined several prestigious private collections.
" Samuel Gomez’s complex metal shapes are machinery and pipes wrapped in successive contortions, in a strangling labyrinthine. 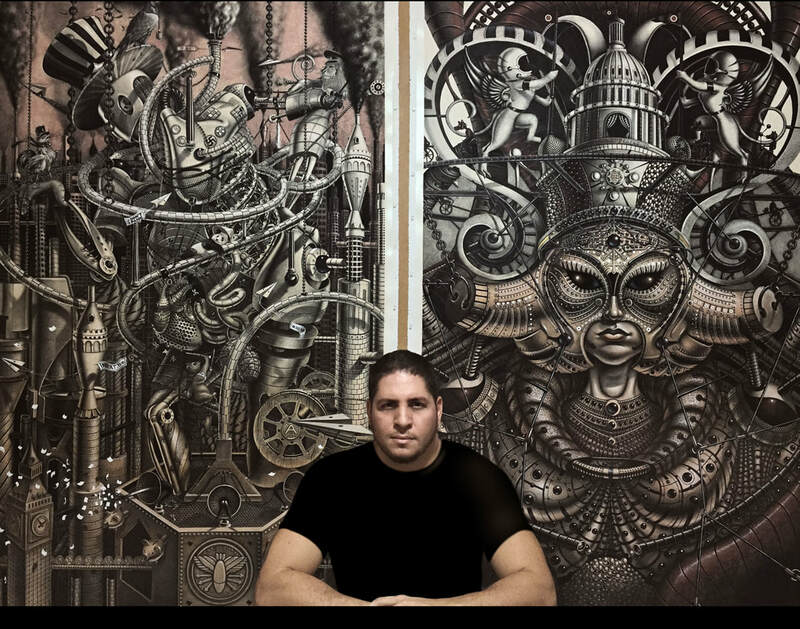 His drawing is an allegorical story where imagery and symbolism proliferate. He has the ability to bear a resemblance to everything: It can resemble the pipes of a combustion engine, as well as the entrails of a firearm that (like a grenade) could burst at the slightest careless gesture. It’s also similar to oil pipelines, with human intestines or the brain itself. The pressure valves indicate an unstable balance. A delicate operation that, in a psychosomatic reaction between gas discharges and a mental diarrhoea, diagnoses a machine on the verge of a nervous breakdown. It simultaneously looks like a wind instrument and fallopian tubes. A perfectly tuned and enormous reproductive structure, which generates some dissonant metallic and radioactive specimens. A semiotic criticism of a capitalist and politicized society, the ironic future of automation, where, between man andmachine, there are more similarities than differences. The new industrial revolution comes up with a significant changein roles, and their total perversion of functions. Now, the machine produces the man. The man works for the machine, being an integral part of it. It is always at its service, and it’s disposal. Gomez creates a hybrid being that, in a proliferation of scales, trespasses the macro and the microcosm. A future society where the organic fabric is replaced by the industrial fabric. Where, at all costs, all kinds of mechanisms keep feeding a mechanical ecosystem. A metallic web that weaves kaleidoscopic patterns, in a knit that twists itself, and projects to infinity. A high-precision drawing (with unusual detail) traces our fate with a geometric accuracy." ​Texts by Pedro Boaventura, Art Galaxie. Samuel Gomez received a BFA in 2001 from Parsons School of Design in New York. Gomez is a member of the Drawing Center & The Americas Society from New York. He currently lives and works in New York.